No matter how much we think we know about fishing and the amazing places on this earth to fish there is always going to be a place that surprises you. 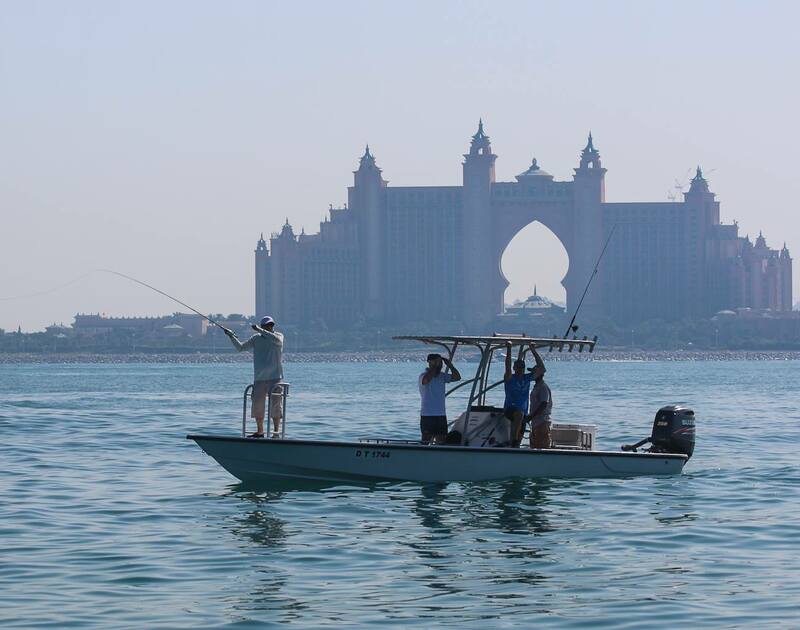 Dubai one of the tourist hot spots of this world is fast gaining a reputation as a fly fishing hotspot. 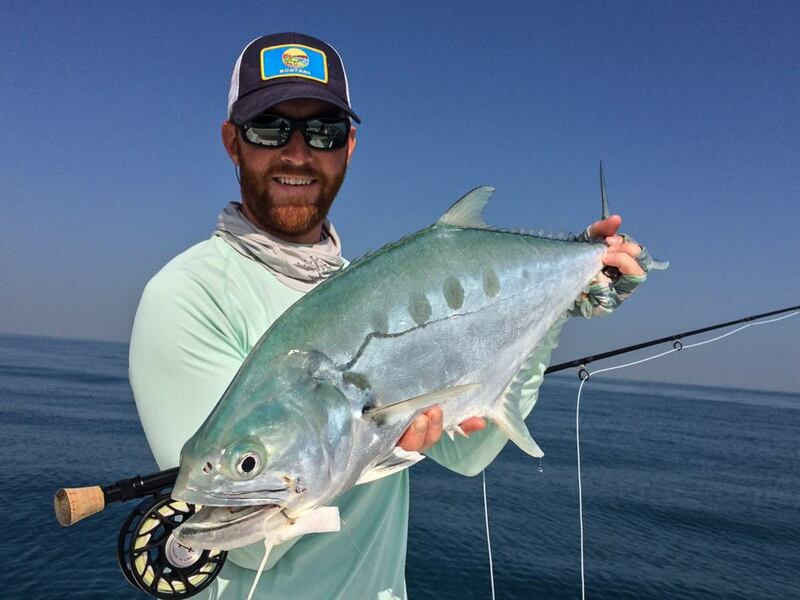 “Run ‘n’ Gun” targeting some of the best fly fishing sports fish on this earth. These guys know what they are doing and the water around their part of the Gulf they know like the back of their hands. 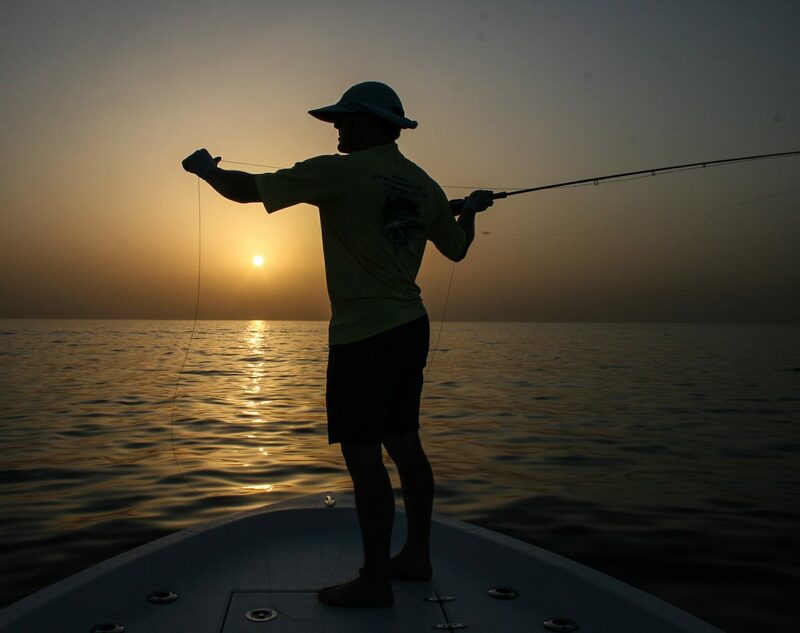 Check into your amazing Dubai accommodation have a delicious meal in readiness for your early AM 1/2 fly fishing. We can help you make this the best stopover ever!! Maybe we can help you rethink Dubai as just a layover destination. That’s how we like it done! 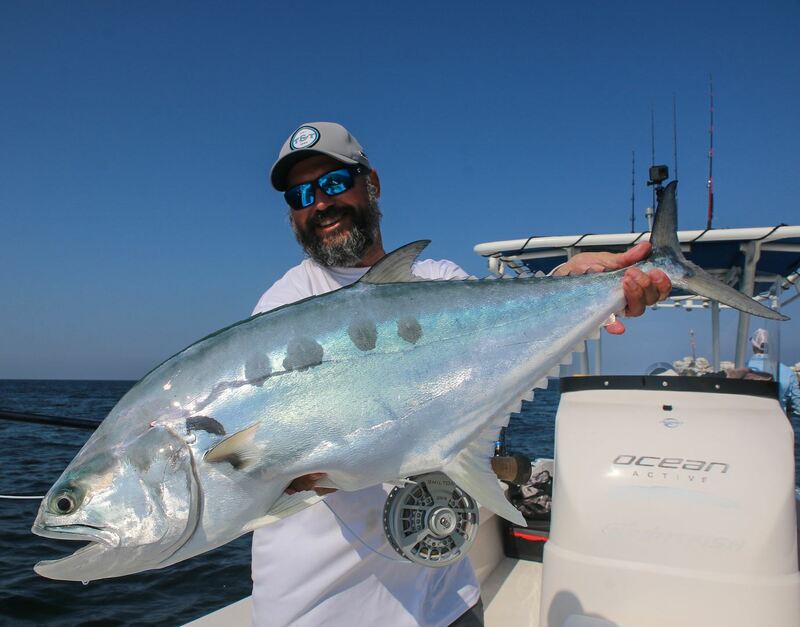 QUEENFISH, Queenies as they are fondly known are purpose-built for fly fishing, they are visual, aggressive, jump, take flies easily and are an amazing looking fish. Plus the majority of the time they are sight fishing to them! 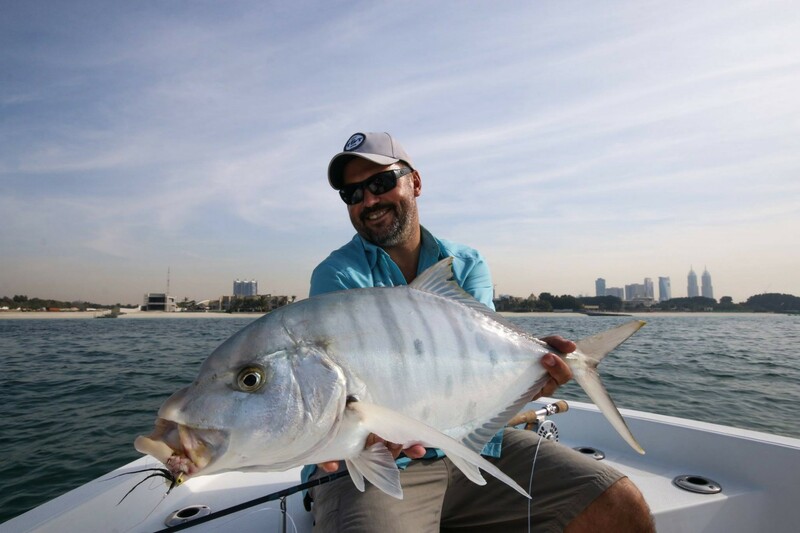 GOLDEN TREVALLY, Goldies as we know them locally are what we refer to as Dubai Gold! These are very special fish to catch and certainly brighten your day when we manage to catch one! 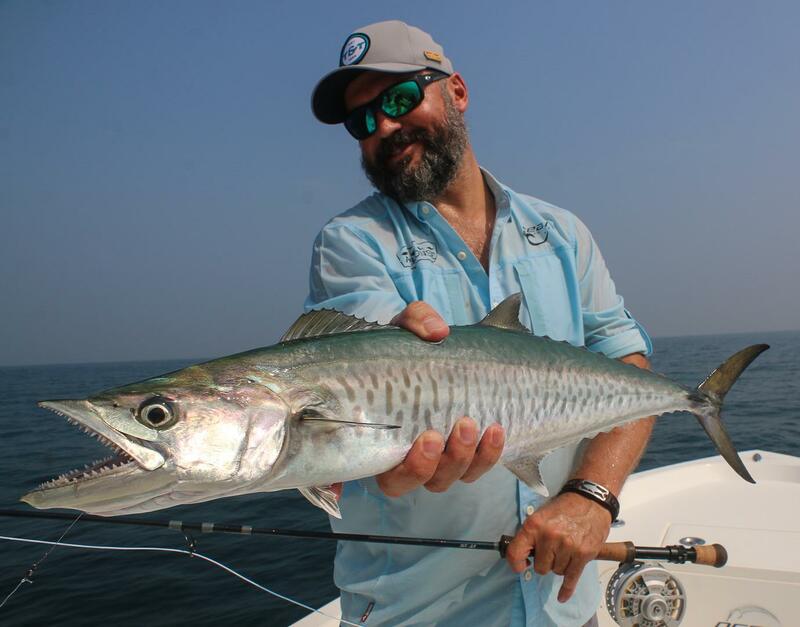 KINGFISH, known as Kings, this member of the razor gang normally cuts off your flies and keep us entertained with big aerial smashes followed by cut off flies! 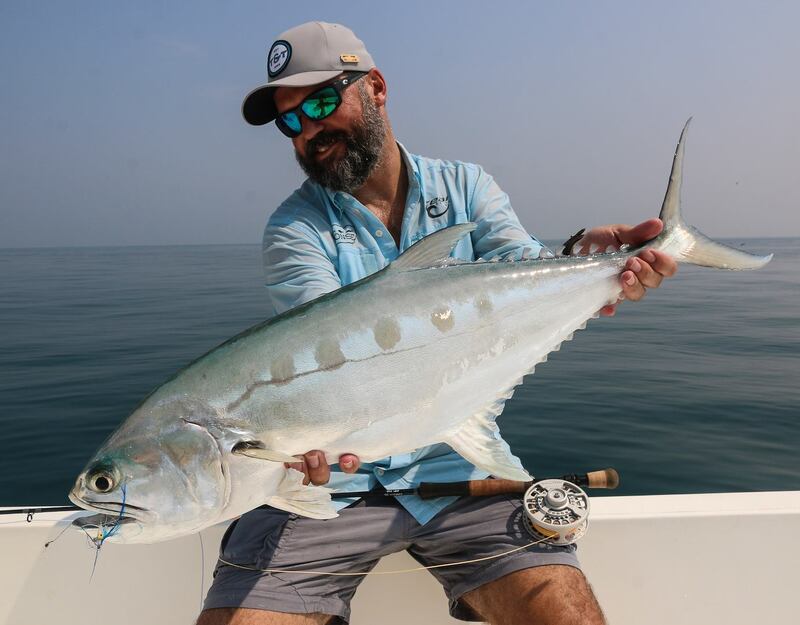 BONITO, Bonnies are truly the speedsters off Dubai and we get a good run of big bonnies in winter that will tear off any backing until you have to turn and chase them. To hook them is one thing to land them totally different! 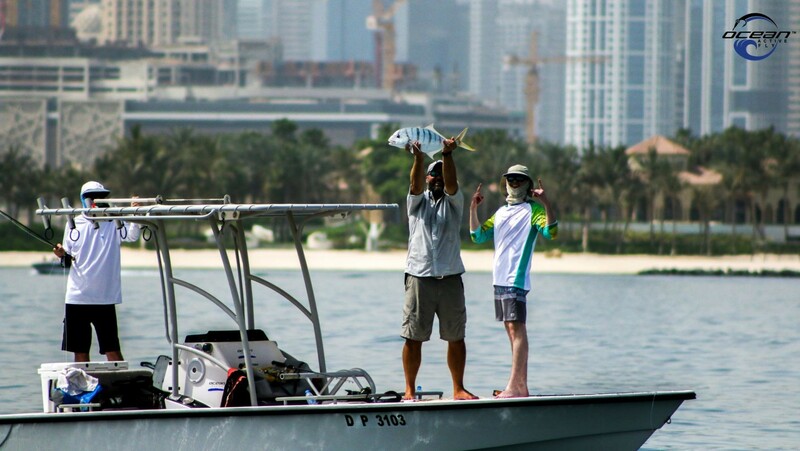 Fly fishing off Dubai is truly unique and we refer to it as urban fly fishing as you are at times fishing in front of the 7 Star Burj Al Arab Hotel, Atlantis Hotel, Palm Islands, World Island or the 200 skyscrapers in the Dubai Marina. Their trips are easy and usually half day in the morning or afternoon leaving enough time to explore the many sights of Dubai. 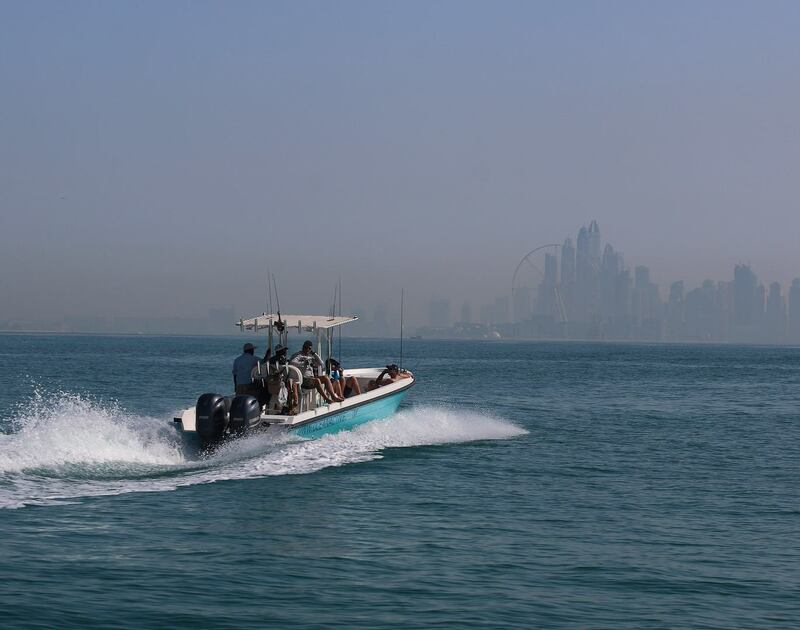 Dubai is the perfect destination for a quick holiday, layover on your way to another destination or if you live in UAE and want to cure the fishing bug. 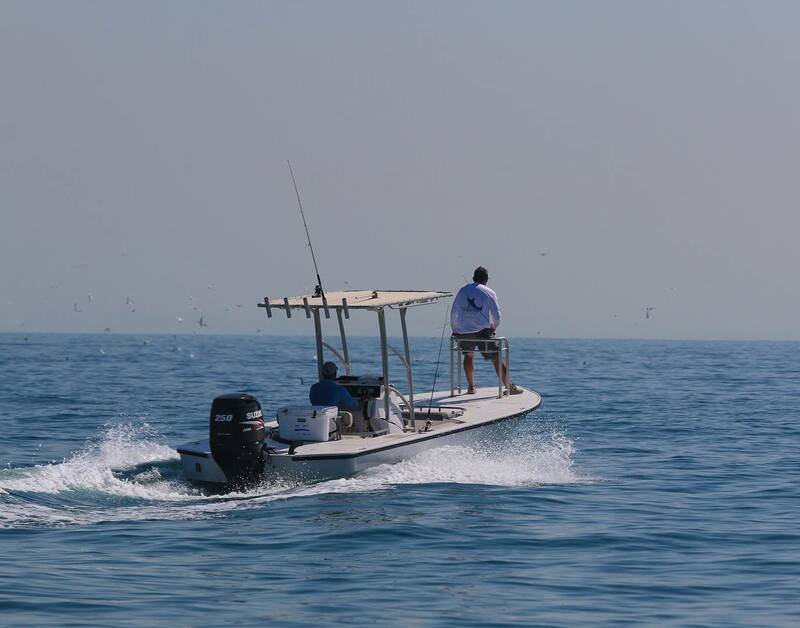 We offer 4 and 6-hour charters. Leaving from Harbour 3 in Umm Sequim close to the Burj Al Arab Hotel. 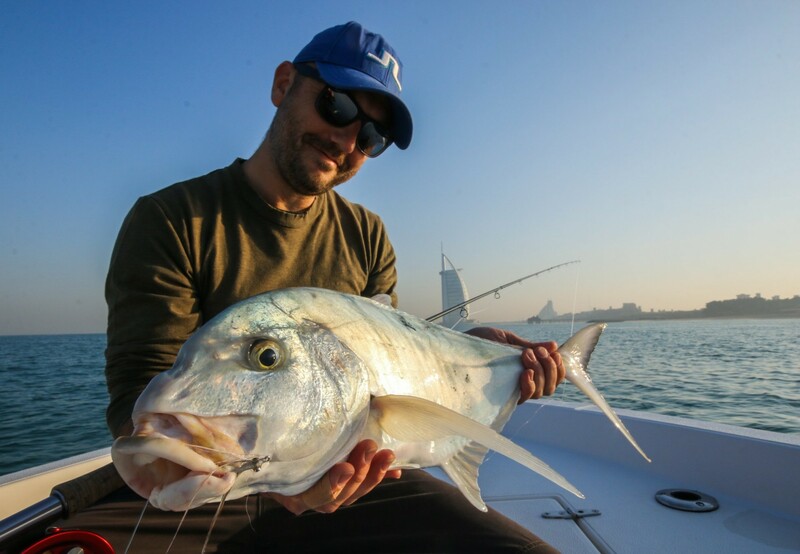 Dubai is a great destination to stretch a saltwater fly line. The fishing is all from boats and we can get up close to the fish but you will still need to be able to cast a decent accurate line. RODS: We use 9# or 10# quality fly rods like Thomas and Thomas Exocett rods. 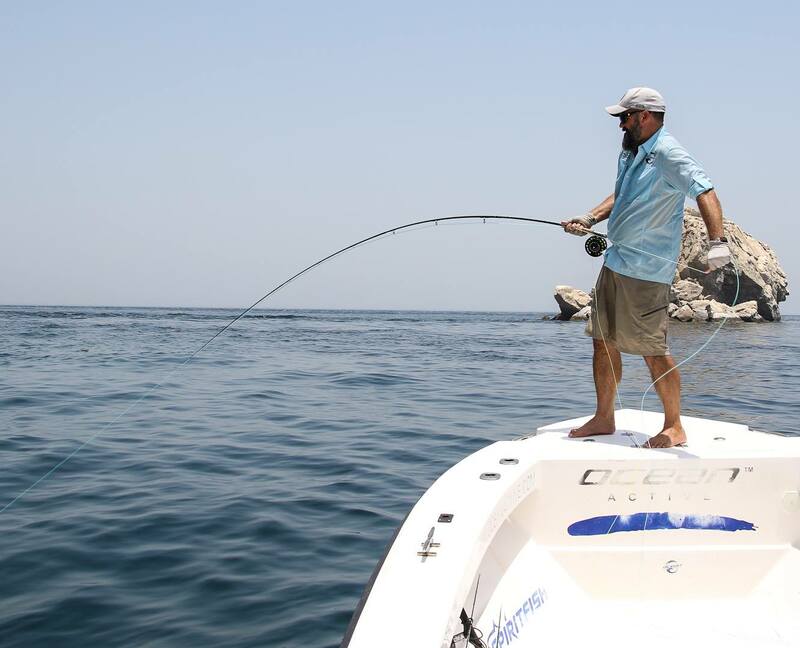 The rods need to be fast action and are required to cast a decent line with a heavy fly plus able to lift a big fish when under the boat. REELS: We use a quality cork or mechanical drag reels that have a smooth drag and can stop a big fish, we use Shilton, Abel and Hatch reels. LEADERS: We mainly use a good quality 25lbs Fluorocarbon leader of about 9ft long. If the big queens are around we will go up to 30lbs. FILES: We mainly use clousers tied in natural colours (grey, tan, olive, blue, black and chartreuse) on a 1/0 SL12 hook. We use sparsely tied flies with a slim profile and minimal flash to imitate the small sardines in Dubai which are long thin and have a darker blue/greenback. Other baitfish patterns will work and for a bit of fun we use gurglers or poppers tied on 2/0s to get some epic surface bites. ADDITIONAL: Always bring your passport on the boats for the coast guard. Generally, their weather is warm so wear UPF quick dry clothes with a decent cap, polaroid sunglasses and suntan lotion. Bring a camera but generally, their guides will take the pictures and send to you via WeTransfer. Dubai has some of the best hotels in the World. Ocean Active has partnered with several amazing hotels to offer the best options for luxury, logistics and activities for there trips. As their 5* option, they offer the One and Only Royal Mirage, Address Hotel in Dubai Marina and Le Meridien Mina Siyahi. We have a great 4* Hotel they use Media One in Media City and lastly offer a good value option the Ibis Hotel on Sheikh Zayed Road which is a 3* hotel with good access to their marina and other activities. They offer several packages for Their clients which include Gold (5*), Silver (4*) and Bronze (3*) Packages to suit every budget and requirement, the packages take care of all of the logistics, hotels and charters ensuring you have a seamless fly fishing experience in one of the best cities in the world! Dubai airport moves over 90 million people a year. There are over 100,000 hotel rooms for you to choose from. FishingEarth we get excited for you when you are going on a FishingEarth Fishing Adventure. But the thing that makes us smile is when you walk in your front door ‘home’ safe and sound. This is the perfect layover at any destination you have ever experienced. Depends if you just wanted to target Dubai Gold (Goldens) or you want to cast to a flyfishing F1 sports species like a Queenfish and then off to Ferrari world to have a look at a red-hot F1 car. There are over 1000 flights per day in and out of Dubai… we are confident that we can find you a flight. Q.Do I need my own fly fishing gear? A. You are more than welcome to bring your own. If there is no room in your travel bags these guys have some of the best gear going! A. There are few places on this earth where you can look out your hotel room checking out your fishing spots of the morning. The water is clear and the fish are fast!! These guys are great at getting line burning off reel fast! A. It is almost like having that perfect day 365 days a year weather wise. Although July & August get DAM hot up to mid 40 degrees. Q. What else is there to do in Dubai? Q. What does FishingEarth recommend you have a look at? A. Bastakia Quarter is one of the locations where you can get the feel for the area before Dubai became the city it is today. A. Drink bottled water in Dubai, all Dubai tap water is from desalination.